La Roche-Posay are by far my favourite, more affordable skincare brand. 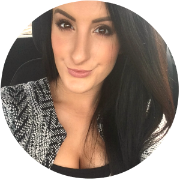 I just love how stripped back their products are and everything I try from them does wonders for my skin. Although my face and body aren't too sensitive for the most part, my eyes are a different story. Even the slightest breeze causes them to stream and I need to be careful when applying makeup close to my lash-line, or they can get red and irritated. 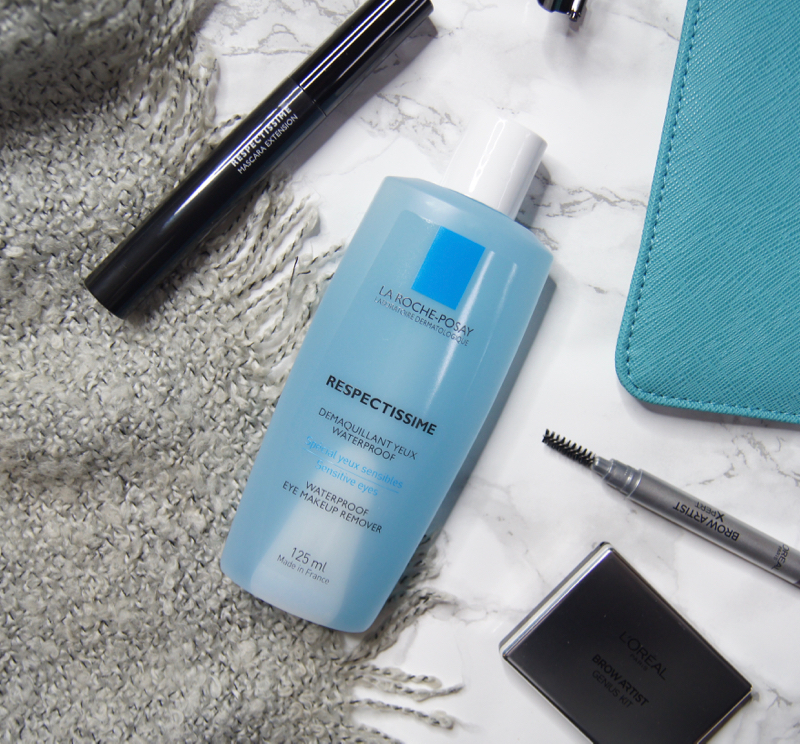 For anyone that wears contact lenses or suffers from sensitive eyes, La Roche-Posay have come to the rescue with their new Repectissime line, which features a waterproof eye makeup remover and a range of mascaras, eyeshadows, liners and brow products. I've tried a couple of the high-street brand's makeup products before, including their Effaclar BB Blur, so I couldn't wait to give their new releases a try! Using a separate eye makeup remover alongside my cleansing oil isn't something I'm used to. As my evening skincare routine already consists of a million steps, I've always killed two birds with one stone and used the same product to remove all my makeup in one go. So, when I received the new Respectissime Waterproof Eye Makeup Remover, I thought I'd give it a go, despite expecting it to be an unnecessary faff to use. The Respectissime Eye Makeup Remover has been formulated especially for those who have sensitive eyes and/or wear contact lenses. Having dry skin which sometimes flares up into angry patches around my eyes, I know the worry of using certain products around the delicate area when it's irritated. Being fragrance-free, paraben-free and made from a strict set of ingredients that should be suitable for intolerant skin, this makeup remover is a lifesaver for those who react so easily to beauty products. It's super gentle and feels soothing and nourishing on the skin and I didn't experience any stinging or burning sensations whatsoever. Although I don't wear waterproof mascara on a regular basis, I always like to pile it on and often use long-wearing formulas that can be a pain to remove. Considering how mild the formula is, I was shocked to find that it works in seconds and dissolves every scrap of eye makeup with ease, even with stubborn mascaras. No rubbing needed. I simply soak a couple of cotton pads, gently press them over my eye area and hold them there for about half a minute. When I take them off, pretty much all my eyeshadow, liner and mascara has been broken down. If I've been wearing a truck-load of eye makeup, then I'll occasionally need to turn the pads over to gently sweep away any remnants, but I never need to scrub at my lashes when I use it. As it has a bi-phase formula, it's crucial to give the bottle a vigorous shake before use, so that it works effectively. Similar to micellar waters, this makeup remover resembles water in consistency. But, as it's a bi-phase formula, it does have an oil element to it. When applied to the skin, it instantly feels comforting and nourishing, but there's no super greasy film left behind. There is a slight moisturising residue, but it absorbs pretty much straight away. If you double cleanse in the evening, then washing your face after removing your makeup will rinse any traces of makeup remover away anyway. This eye makeup remover costs £11 for 125ml, which works out as great value considering how little you need per use. Compared to other popular bi-phase formulas from the likes of Clarins (£19 for 125ml), it's a considerable cheaper option and works just as well, if not better! There's four mascaras in La Roche-Posay's Respectissime range; Extreme Volume Intense, Multi-Dimension, Waterproof Extreme Hold and Extension Length & Curl. Fragrance-free and nickel-controlled, each one is designed to be gentle and promote maximum tolerance during wear. 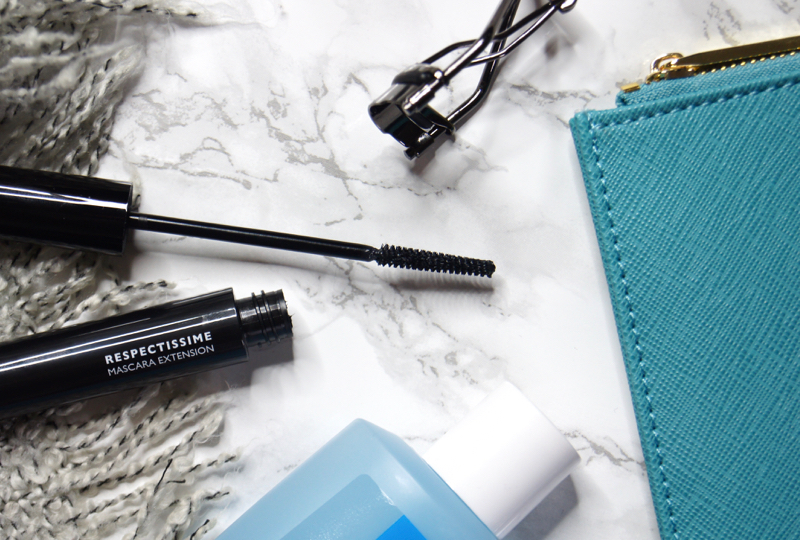 The Respectissime Extension Length & Curl Mascara features a natural bristle brush, rather than a plastic wand. With every use, you can feel how effectively it grips the lashes right at the root and smoothly coats every hair, even the tiniest wisps, so perfectly. Being so thin and tapered, the brush allows you to get right to the corners of the eyes and be really precise. The only downside of it having a smaller, slimmer applicator, is that it can take longer to apply, compared to mascaras that have huge brushes and create defined lashes in one swipe. When you pull the wand out of the tube, the majority of excess is removed, so you're left with the perfect amount of product. Not too much that it's difficult to apply without creating a mess and smudging it everywhere, but not so little that you need to re-dip the wand multiple times, or it starts to dry out and clump as you apply. According to the brand, the mascaras also work to strengthen lashes over time, but I haven't using it for long enough to vouch for that claim, yet. What I love most about this mascara, is that it's so versatile. With one coat, it provides a lush, natural daytime lash, extra depth & definition are created with two and you can achieve full volume, drama and amazing length with three. The polymer-rich mascara formula is so slick, thick and luscious, which makes the lashes look so healthy and nourished. I find many lengthening mascaras are great at adding extra inches to the lashes, but end up clumping and looking spidery if you attempt to build up layers. In contrast, La Roche-Posay's lengthening version really boosts the lashes, without leaving them looking dry and brittle. It's one of those mascaras that gives a fluttery, soft, fanned-out finish that's so sophisticated. Once dry, the lashes don't feel at all heavy or crispy and I haven't experienced any flaking or transfer throughout wear. Personally, though, transferring is never really a problem for me anyway. All of the mascaras in the new range cost £16, which is more expensive than other high-street alternatives. But, for anyone who struggles to find a mascara gentle enough to suit their intolerant skin, then I'm sure this range will be a welcome addition to their makeup bag. 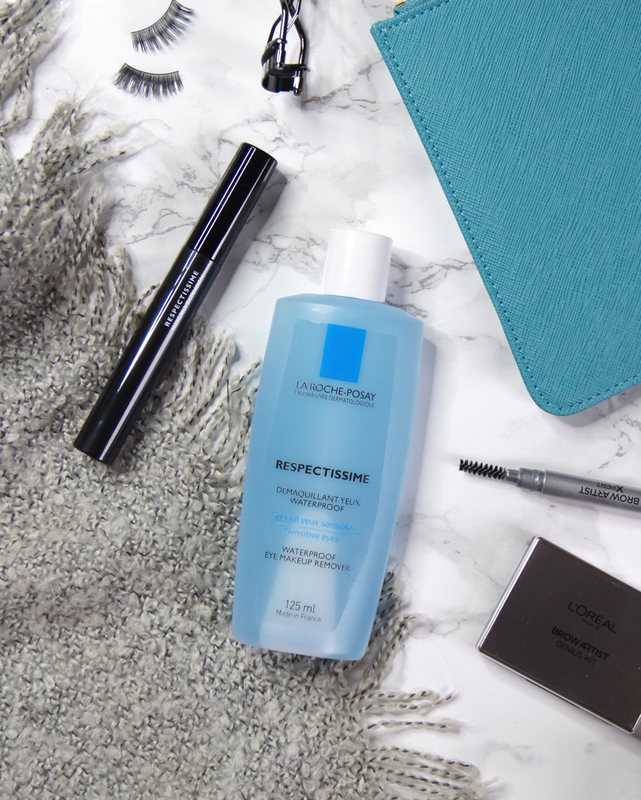 Have you tried anything from La Roche-Posay's Respectissime range? I didn't know La roche poasay made makeup. I hear many people rave about their skincare but have not heard once about any makeup products from them. I'm already keen to try out their skincare products and now it looks like i definitely need to pick up that mascara. Wow your lashes look amazing! I always associate LRP with skincare, had no idea they did makeup too.